A franchisee of Mr. 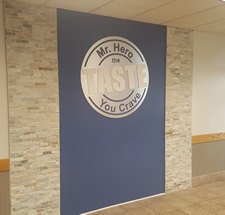 Hero will receive an exclusive territory, as well as a wide range of promotional materials suitable to your budget, from grand opening packages to high caliber tv commercials designed to promote the Mr. Hero brand in your market. In addition, the franchisee will receive classroom and field training, product and training manuals, and ongoing support. A Regional Director will be assigned to assist you in field initiatives and guidance. Would you like more information on owning your own Mr. Hero franchise? Click Here. The information presented on this site does not constitute an offer to sell or the solicitation of an offer to buy a franchise or business opportunity in any state or country where, nor is such an offer to sell or the solicitation of an offer to buy directed to any person to whom, it would be illegal to do so. Presently, R.D.C. is registered (and filed) to offer and sell "Mr. Hero" franchises in Ohio. R.D.C. will consider registering or filing in other states given the right franchise or business opportunity. No "Mr. 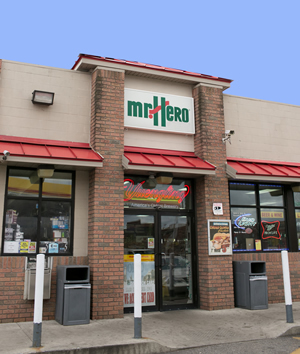 Hero" franchise may be sold to persons outside of Ohio unless and until an offer and sale of "Mr. Hero" franchise has been registered and/or filed and declared effective in a state outside of Ohio and the "Mr. Hero" Franchise Disclosure Document permitted to be used in such state has been delivered to the purchaser prior to the sale and in compliance with such state's franchise law. At Mr. 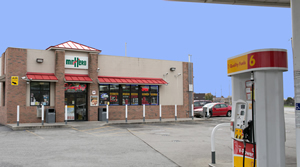 Hero, we want to be your premier partner for non-traditional locations, such as C-Stores and Super Pumpers. If you currently have an existing business and are looking to expand your portfolio, Mr. Hero may be the perfect fit for you! Q. How much space would typically be needed? A. Minimum of 200 + square feet depending on shared cooler, freezer, storage, and prep areas. Q. Do I need outside signage? Q. What are the menu options? Q. Can I use my existing POS system? A. Mr. 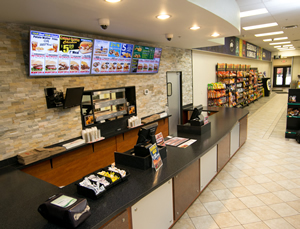 Hero has a specific POS system that you will need to incorporate. 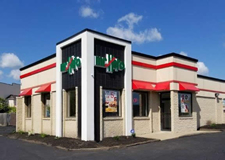 Converting a former restaurant, pizza shop, or other business is also an option when considering a Mr. Hero restaurant. Many of these businesses occupy desirable locations and may be converted at a lower price than the cost of new construction. 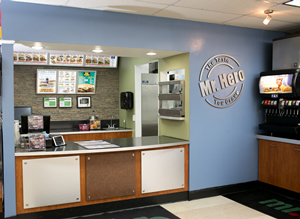 In addition, these former businesses may have some of the mechanicals already in place that can be utilized for your Mr Hero restaurant saving you money. RDC's extensive training program will give you the confidence necessary to successfully operate your Mr. Hero restaurant. 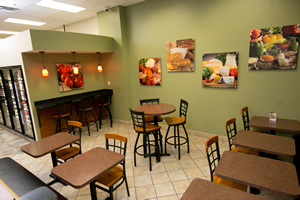 The field support provided to you by RDC is unparalleled in the food service industry! You will receive extensive training provided at our corporate facility. We combine classroom instruction with hands-on practice and cover a multitude of topics and procedures designed to efficiently operate a Mr. Hero restaurant. Your Regional Director, the Marketing Manager or other members of our corporate staﬀ will visit your store to evaluate your operations and discuss your needs. From quality assurance evaluations, assistance in local marketing, approved vendors, distribution networks, and control and inventory systems, we will guide you in ways that will enhance your business. -Includes back area and kitchen area work equipment. -In-store digital menuboard, all interior and exterior signage. The chart above illustrates estimated costs of opening a Mr. Hero restaurant. These ranges are to be used as estimates only, and are based upon numerous factors that include, but are not limited to: the size of the restaurant; labor and material costs; geographic variables; financing and architectural fees. Franchisees expanding Mr. Hero into undeveloped areas where brand awareness hasn’t been established should expect to incur higher working capital and marketing fund requirements. Mr. Hero may provide some royalty conversion to be used as additional marketing funds to help promote the Mr. 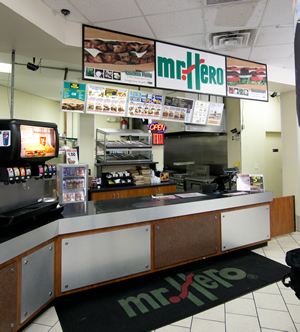 Hero brand in newer markets; discuss details with your franchise sales representative. This advertisement is not an offering and does not constitute a contract. An offering may be made only through our Franchise Disclosure Document. If you would like to receive a copy of our Franchise Disclosure Document, please contact RDC. If you’ve already seen success in managing and growing your own business or multiple store locations, this opportunity may be for you! With Mr. Hero, you have the potential to grow by owning a market. As an Area Developer, you will be purchasing the exclusive rights to a designated area. 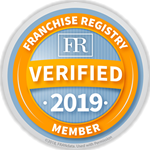 Our Corporate office and dedicated personal provide the support you need to be on your way to developing your own exclusive franchise territory. We encourage you to explore the opportunities with us. Listed below are some of the most frequently asked questions in regards to becoming a franchisee in the Mr. Hero system. Q: Is Mr. Hero listed with the SBA Franchise Registry? A: Yes, Mr. Hero is listed with the SBA Franchise Registry. Q: Do I need to have experience in the food service industry to be considered as a potential franchisee in the Mr. Hero system? A: Although helpful it is not a requirement. The want, desire, willingness to learn, aspiration to succeed, and entrepreneurial spirit along with a positive attitude are just some of the qualities we look for in a potential franchisee. Q: What training do I receive? How long is the training program? Where do I get trained? A: We provide a 3 week training program to new franchisees. There is a classroom portion of the program that is held at the Corporate Office. The "hands on" portion of the program is held at a corporate owned Mr. Hero restaurant. However additional time may be added to the training program to better fit the trainee’s needs. Q: How much is the franchise fee for a Mr. Hero restaurant? A: The franchise fee is $20,000. Q: How many years do I get in the franchise agreement? A: The franchise agreement is for 10 years. A: The royalty and advertising fees range from 3-5½% each. These fees are paid weekly through Electronic Funds Transfer (EFT). Q: Is there a grand opening fee? A: Yes. The grand opening fee is $5,000 but expect the fee to be higher in newer markets. This provides for advertising and the promotion of your specific Mr. Hero restaurant! Q: How much square footage will I need for my Mr. Hero restaurant? 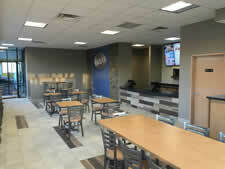 A: 1,500 to 1,800 square feet is the average for a typical restaurant. 200 square feet is the minimum for a co-branded unit depending upon shared cooler, freezer and storage space. Q: How much money do I need to be considered for a Mr. Hero franchise? A: Typically individuals will need in addition to the franchise fee a minimum $75,000-$100,000 in non-borrowed personal resources (liquid assets) along with an overall net worth of at least $350,000 to qualify. Higher amounts may be required for newer markets. Q: How much will it cost to build my Mr. Hero restaurant? A: The investment range to build out and furnish your unit will vary by size, location, and other factors. Q: Does Restaurant Developers Corp. provide my financing? A: No. However we can direct potential franchisees to sources that have provided financing options to other Mr. Hero franchisees. Q: Will Restaurant Developers Corp. help with site selection? A: Yes! We will review a potential site with you. 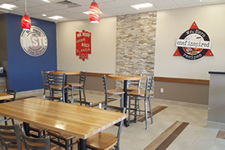 But in newer developing markets it is preferred that the franchisee has a knowledgeable understanding of his territory with locations or areas in mind. If needed, we can direct you to other resources for additional options; including, having consultations with a commercial broker of your choice. Q: Do I receive a protected territory for my Mr. Hero restaurant? A: Yes! Every franchisee in the Mr. Hero system has a protected territory. Q: How long does the process take to open a Mr. Hero restaurant? A: Once the franchise agreement is signed, a site has been selected, and you have signed the lease (if applicable), the average time frame is between 3 to 6 months, however this may vary depending upon several factors. Q: Can I own more than one Mr. Hero restaurant? A: Yes! As long as you meet the financial and management requirements necessary there is no limit as to how far you can grow with Mr. Hero. Q: I would like to own and develop an area, such as a county, for multiple Mr. Hero restaurants within your expansion zone. Is this a possibility? Would each one of my Mr. Hero restaurants have a protected territory? A: Yes it is possible to buy a larger area, such as a county, for multiple Mr. 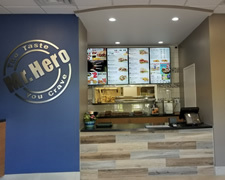 Hero restaurants. In this case the entire area, and each individual franchised location would have a proteced area. Q: Can I convert my current restaurant to a Mr. Hero? 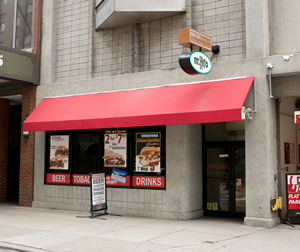 A: Converting a former restaurant, pizza shop, or other business is also an option when considering a Mr. Hero restaurant. Some of these businesses occupy desirable locations that may be converted into a Mr.Hero for lesser investment if savings from existing mechanicals is a possibility. Q: I am really interested in becoming a franchisee in the Mr. Hero system. A: Click here to answer a brief questionnaire or to request additional information. Please fill out the Mr. Hero Franchisee Qualification Request form below. College Major Describe any training in sales, management, retailing or post graduate study. What are you applying as? -- SELECT --	Individual Partnership Corporation Have you ever failed in business? -- SELECT --	Yes No If so, why? How involved will your partner be in the business? Verification of all financial information will be required before awarding a franchise. I authorize you to make investigations of my credit, character and ability, and to contact anyone, whether listed or not, including former employers, in order to obtain personal information about me. I release all such persons from any liability or damages which may be incurred as a result of the furnishing of such information. I also certify that all information in this application is true and complete. Applicant's Typed Name - Signature is required at initial meeting. 04/19/2019 Spouse's Typed Name - Signature is required at initial meeting. This application is confidential and does not obligate the applicant to purchase or the franchisor to sell a franchise. If your franchise will be run as a partnership, each partner must complete a Qualification Request Form.